What Is The Difference Between Leadership And Management - Many people have assumed that leadership and management is the same thing. However, those two things are actually different thing even though I have to let you know that both have to go hand in hand in their application, especially in a business situation. 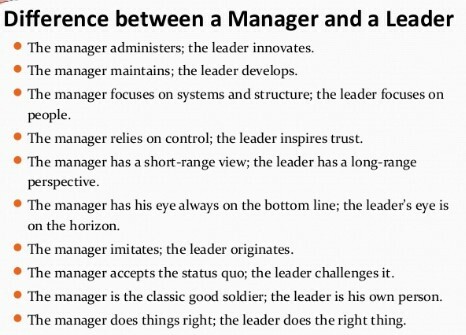 Thus, if you want to aim to be a good manager, what you need to do is to understand the different between a leader and a manager. After knowing the difference from the two, what you need to do afterwards is to combine them in your leadership. 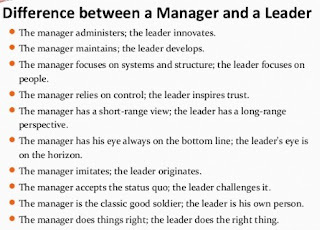 So, what are the difference between leadership and management? Here we go! Being able to administer is the first job of a manager. However, administering some task to the subordinate needs some skills of a leader. Being a manager, you cannot just ask your subordinate to do the things that you want to do. You may have to give them some examples of how to do that specific task that you ask your subordinates to do. In addition to that, if you want to show how well you lead your team, you may also create some innovation. Do not just copy all of the movements that your previous manager did! You are a different person, so that you may need to create and find a new way to do the same task. Your ideas and innovation needs to be more efficient than your previous manager did. That is the first difference between leadership and management. Another difference between leadership and management is the fact that a person who deals with management will mostly deal with the structure of leadership. However, a true leader within the company goes beyond that. He or she needs not only to manage the structure, but he or she needs to know how to control and motivate the people.